After UK retailer Expansys started cancelling orders for the 64GB variety of the Galaxy S III, we feared that Samsung may have given up on the device. Apparently, that's not the case, as today a company's spokesperson has stepped in to clarify the situation. "The 64GB model of the GALAXY S III will be available during the second half of this year. The market availability and timing may vary and will be determined at the time of release." 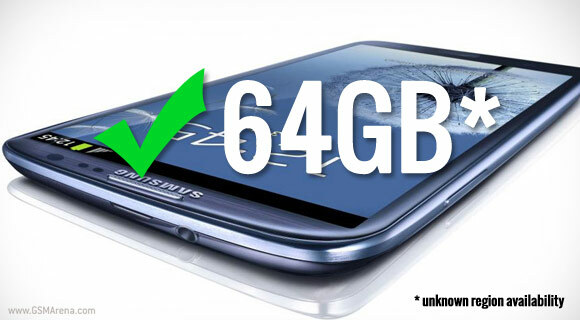 So, Galaxy S III fans who've been waiting for the 64GB model should breathe a sigh of relief, even though the wait isn't over. After all, if you absolutely must have 128GB of storage (with a 64GB microSD card), waiting a couple of extra months shouldn't be that hard. Unfortunately, Samsung hasn't disclosed the market availability and which regions will enjoy the most expensive version of its flagship smartphone. wat ix da prblm in the casing of s3..? Some of us listen to FLAC audio. Storage is a must.